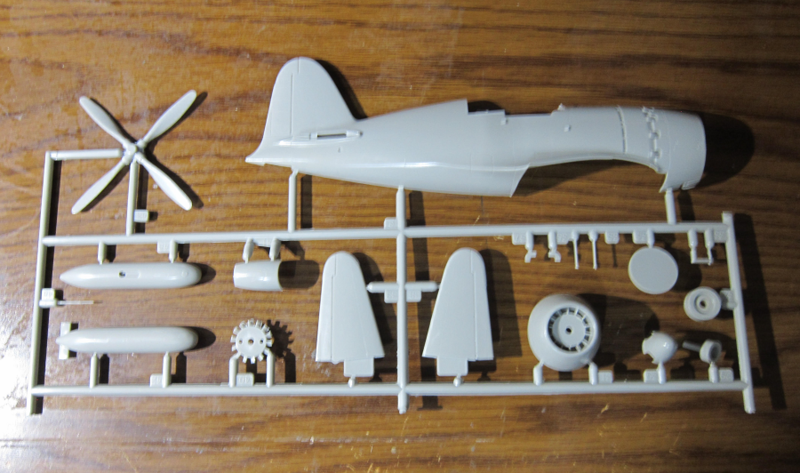 Japanese Mitsubishi J2M3 "Raiden" Allied code name "Jack"
My kit has a copyright date of 1973. Kit is shown on the net at 7 places in Europe and 4 places in the USA. The US stores are Kit Lynx for $12.53, Section 8 Hobbies for $13.20, Sprue Bros. for $13.49 and Mega Hobbies for $13.53. 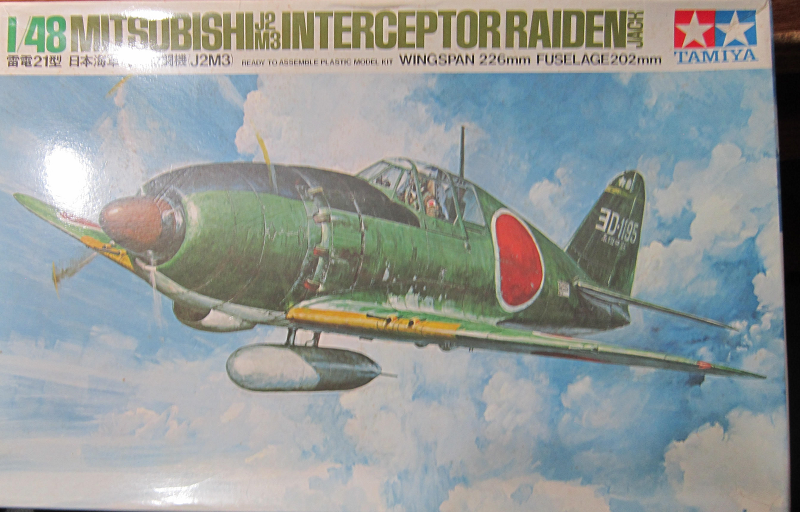 The Mitsubishi J2M Raiden ("Thunderbolt") was a single-engine land-based fighter aircraft used by the Imperial Japanese Navy Air Service in WWII. The allied reporting name was "Jack". The J2M was designed by Jiro Horikoshi, creator of the A6M Zero, to meet the 14-Shi (14th year of the Showa reign, or 1939) official specification. It was to be a strictly local-defense interceptor, intended to counter the threat of high-altitude bomber raids, and thus relied on speed, climb performance, and armament at the expense of maneuverability. The J2M was a sleek, but stubby craft with its oversize Mitsubishi Kasei engine buried behind a long cowling, cooled by an intake fan and connected to the propeller with an extension shaft. Teething development problems stemming from the Kasei engine cooling system, and the main undercarriage members led to a slowdown in production. A continual set of modifications resulted in new variants being introduced with the ultimate high-altitude variant, the J2M4 Model 34 flying for the first time in August 1944. The first few produced J2M2s were delivered to the development units in December 1942 but severe problems were encountered with the engines. Trials and improvements took almost a year and the first batch of the serial built J2M2 Model 11 was delivered to 381st Kōkūtai in December 1943. Parallel with the J2M2, production of the J2M3 Raiden Model 21 started. The first J2M3s appeared in October 1943 but deliveries to combat units started at the beginning of February 1944. The Raiden made its combat debut in June 1944 during the Battle of the Philippine Sea. Several J2Ms operated from Guam and Saipan and a small number of aircraft were deployed to the Philippines. Later, some J2Ms were based in Chosen airfields, Genzan (Wonsan), Ranan (Nanam), Funei (Nuren), Rashin (Najin) and Konan under Genzan Ku, for defense of these areas and fighting against Soviet Naval Aviation units. Primarily designed to defend against the Boeing B-29 Superfortress, the type was handicapped at high altitude by the lack of a turbocharger. However, its four-cannon armament supplied effective firepower and the use of dive and zoom tactics allowed it to score occasionally. Insufficient numbers and the American switch to night bombing in March 1945 limited its effectiveness. Two captured J2Ms were U.S. Technical Air Intelligence Command (TAIC) tested using 92 octane fuel plus methanol, with the J2M2 (Jack11) achieving a speed of 655 km/h (407 mph) at 5,520 m (17,400 ft), and J2M3 (Jack21) achieving a speed of 671 km/h (417 mph) at 4,980 m (16,600 ft). After the decisive Battle of Midway in 1942 Japan's military leaders rushed to re-equip their forces for defense of the home islands. In fighter designs the interceptor role now took priority over forward projection of offensive power. Allied forces, meanwhile, sought to establish air superiority over Japanese-held territories via B-29 bombing raids on industrial targets. The struggle to meet production demands sparked a Japanese initiative to recruit shonenko (child labor) from Taiwan (Formosa). Though the target of 25,000 youths was never reached, over 8,400 Taiwanese youths aged 12 to 14 relocated to Mitsubishi plants to help build the J2M Raiden. The Allied advance took its toll. In 1945 aircraft production in Japan collapsed, as numbers for the J2M reflect. Tamiya is an old prolific model company based in Shizuoka City, Japan. They make all manner of model subjects in the popular scales. The box art shows a Jack flying above the clouds. It is dark-green over light-gray undercarriage, with yellow leading edges on the wings, red spinner, white code 3D-1195 on the rudder, a yellow horizontal bar high on the rudder with Japanese text below it, with 2 white stars on it. It has a black anti-glare panel in front of the windscreen. One side panel shows a Jack that is also dark-green over a light-gray undercarriage, with 2 yellow lightning flashes under the cockpit and white serial no. 352-37 on the sides of the rudder. There is a color illustration of the pilot figure, surrounded by Japanese text. 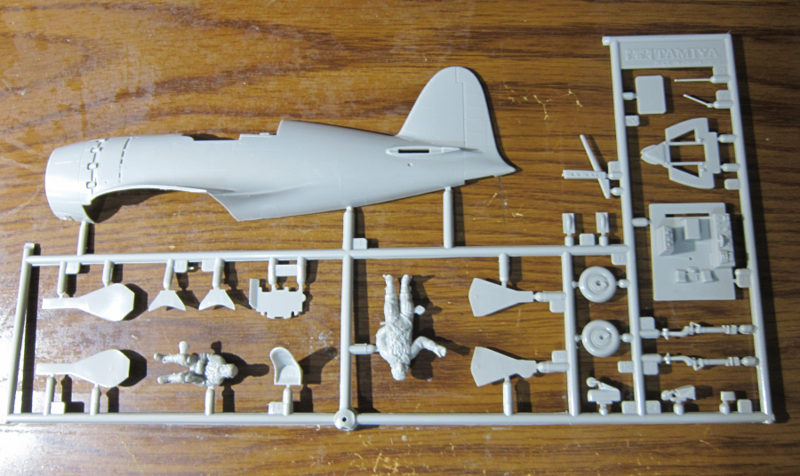 ​The other side panel has 4 color box arts of other 1/48th scale aircraft kits that Tamiya manufactures: a British H.S. Harrier GR. Mk-1, a U.S. Hughes OH-6 "Cayuse" helicopter, a Japanese Mitsubishi A6M2 "Zero" and a Japanese Type 2 float-plane fighter. The kit holds 4 medium-gray trees, a clear tree and decal sheet in a sealed cello bag, 2 instruction sheets. The 1st instruction is a single sheet folded in the center to create 4 pages in 10" x 7" page format. This sheet is all in Japanese. Page 1 begins with a black and white photo of the model made up. It is dark-green over light-gray undercarraige, with white spinner and a white tail code of a Japanese symbol - 1105. Below this is the history of the Jack in Japanese. Page 2 is the painting, marking and decal application instructions, with profiles of the 3 schemes (already described above) and a top and bottom view common to all 3 is shown. Pages 3 & 4 give a total of 6 assembly steps. The 2nd instruction sheet is printed on one side in color on slick-coated paper. 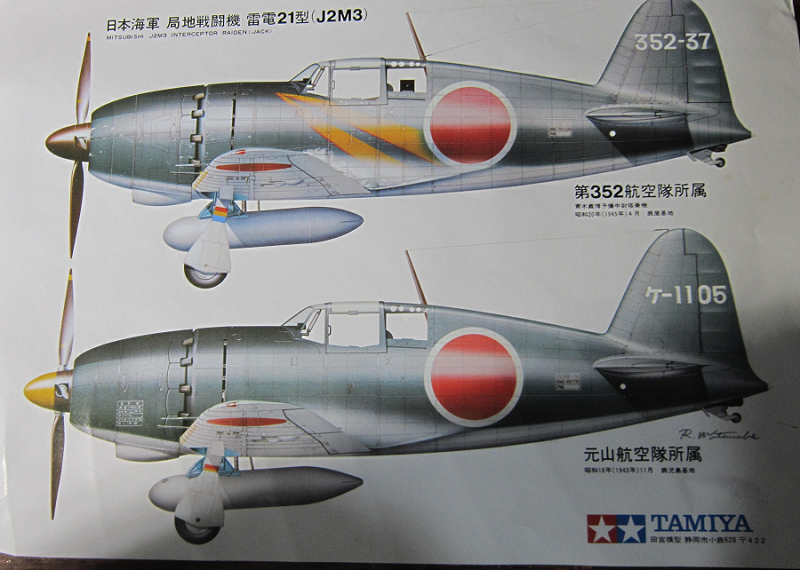 It has profiles of the Jack with the 2 yellow lightning flashes under the cockpit and white tail code 352-37 and the Jack with white tail code Japanese symbol -1105. ​Trees are not alphabetized or illustrated in the instructions. They do have part number tabs next to the parts on them. 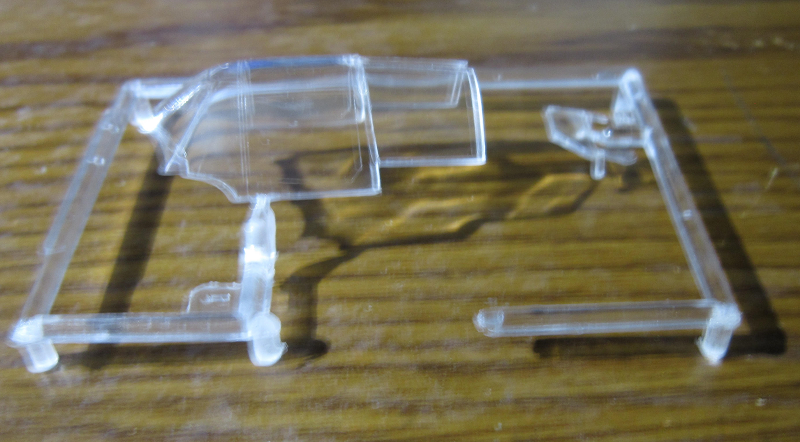 ​The clear parts holds 2 parts of the canopy. 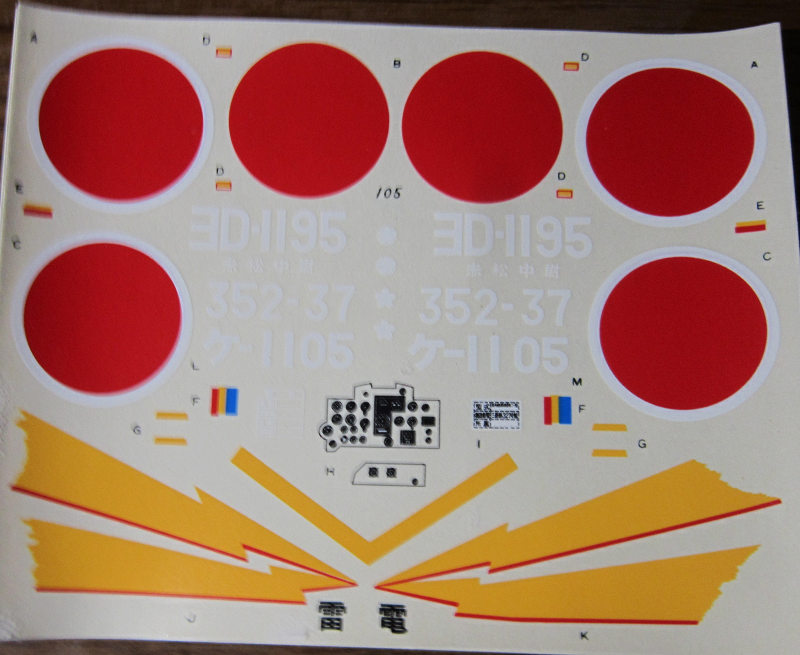 ​The decal sheet completes the kits contents. In addition to the scheme marks it also holds the dashboard instruments and a few stencil marks. ​Kit has nicely engraved panel lines. Flaps are all molded solid.